For all of their cutting-edge technology and hyperbike posturing, Ducati can be a surprisingly traditional company. They’ve stuck with their iconic “L-Twin” [90-degree v-twin] engine since their success on road and track in the 1970’s, in spite of some inherent limitations: it’s a very narrow engine, which is great for cornering clearance and aerodynamics, but it’s also very long, requiring a wheelbase that lends stability, but not agility. And the famous Desmodromic valves? Well, you want to hit 9,000rpm in 1955, valve-float may have been a problem. But today’s screamers clearly show that traditional springs work just fine at high revs and the smoothness of a 90 degree twin can now be approximated with crankshaft trickery and balance shafts. There are advantages to four-cylinder power long recognized by less inflexible companies and even Ducati has had to bend their own rules to be remotely competitive in Moto GP, creating their temperamental v-four. 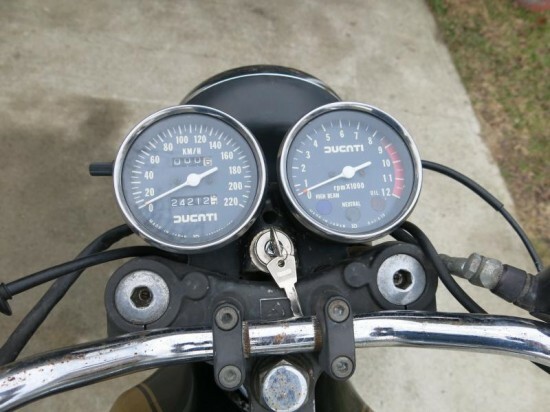 In the 1970’s, Ducati decided the way forward was to develop a line of more affordable, middleweight machines. The L-twins, with their tower shafts and bevel gears were very expensive to produce. So Ducati came up with a compact, affordable parallel twin. 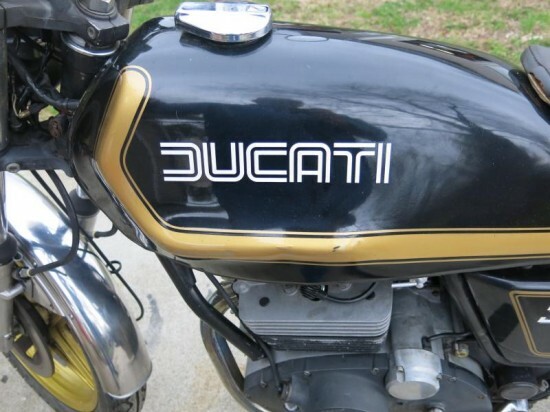 It made sense on paper, but the cost to develop an entirely new engine were high, and Ducati designer Taglioni was not happy with this new direction. The new 500cc engine used simple valve springs and a single overhead camshaft. It made a respectable 35hp, but the styling was perhaps a bit too forward-thinking, and the bike was not popular at all, even when it was redesigned to resemble the more popular Darmah and a Taglioni Desmo head was added. 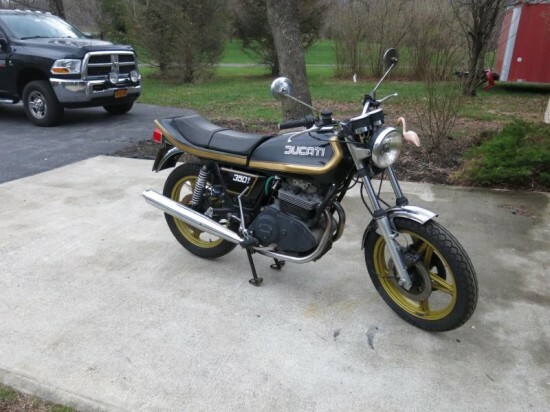 Nice condition for a 36 Year Old Motorcycle It does have some bumps and scratches, not unusual for a bike of this age. Please look at the pictures carefully and ask about anything extra you might want to know. 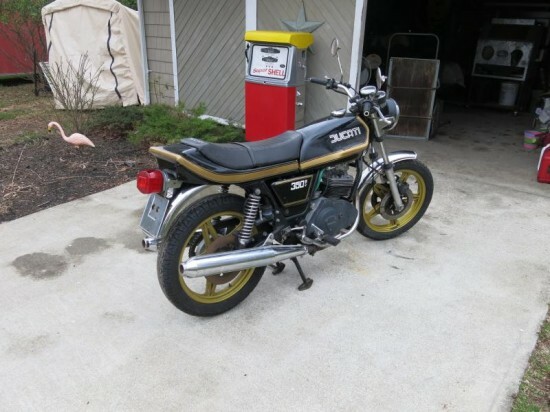 I have had this Duc in the barn for 6 years and ultimately have had no time to play with it, so it’s time to find another owner that will use it. This is really a nice survivor. I have it running (see short video clip) pretty well but I think that carbs will need to be cleaned and setup properly. I installed new fuel petcocks/taps this spring as the old ones were just not making a seal. I still have the old ones to include. The tires are quite old and I have a set to include with the sale. See the video clip to hear it idling away. Humor and horror stories aside, these were popular in Europe into the 1980’s so parts availability might not be so bad, if you’re willing to wait a while for things to ship from overseas. There’s plenty of time left on this auction, but current bidding is up to $810 [?! 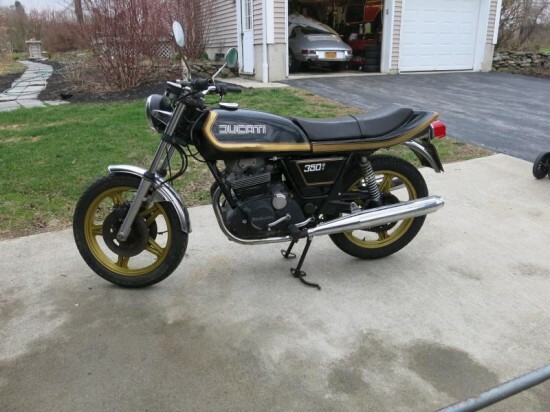 ], so someone really should go on and buy this bike. It certainly won’t be fast, but you will get to answer a ton of questions about it every time you stop for gas.